Its only accepted indications are for children and adults with attention deficit hyperactivity disorder (ADHD) or well-established narcolepsy, generally where non-pharmacological measures have proved insufficient. In some localities it has replaced Ritalin as the first-choice pharmacological treatment of ADHD, of which it is considered an effective treatment. Dexedrine is contraindicated for patients with a history of substance abuse. Certain studies have been performed regarding possible alternate use for antidepressant treatment for HIV patients with depression and debilitating fatigue, early stage physiotherapy for severe stroke victims, and treatment for those with methamphetamine (speed) addiction. Dextroamphetamine is also used to treat fatigue in cancer patients. The drug comes in 5mg and 10mg tablets, or tabs, as well as 5mg, 10mg, and 15mg Spansules (Capsules, or caps). The most commonly used bioavailable form of dextroamphetamine is dextroamphetamine sulfate, which is a salt of d-amphetamine. Possible adverse effects of dexamphetamine include insomnia, reduced appetite, dependence, nervousness, restlessness, irritability, and euphoria that may be followed by fatigue and depression. There may be dryness of mouth, abdominal cramps, headache, dizziness, tremor, sweating, palpitations, increased or sometimes decreased blood pressure and altered libido. The Physician's 1991 Drug Handbook reports: "Symptoms of overdose include restlessness, tremor, hyperreflexia, tachypnea, confusion, aggressiveness, hallucinations, and panic." There have also been reports of growth retardation of children with long-term use, although this effect can be reduced by alternating periods of abstinence from dexedrine. 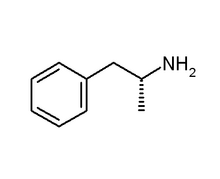 As Dextroamphetamine is a stimulant, it is highly addictive and should be used with caution. The use of Dextroamphetamine for long periods of time may result in drug tolerance, and even physical dependence. Addiction is relatively uncommon when used as prescibed, such as in cases of Attention Deficit Hyperactive Disorder and Narcolepsy. However, the drug is also widely used without a prescription, and can be abused for its sleep-inhibiting properties. Dextroamphetamine is a Schedule II controlled substance, and possession without prescription is illegal. This is due to the extremely high potential for abuse, as well as the severe physical and psychological effects that can result from this. The US Air Force uses dextroamphetamine as its "go-pill." It is given to pilots on long missions to help them remain focused and alert. However, Dexedrine is being phased out in favor of Provigil as the Air Force's new go-pill.